It is with happiness and joy that we share with you that the Firehouse Community Arts Center kitchen is now operational! 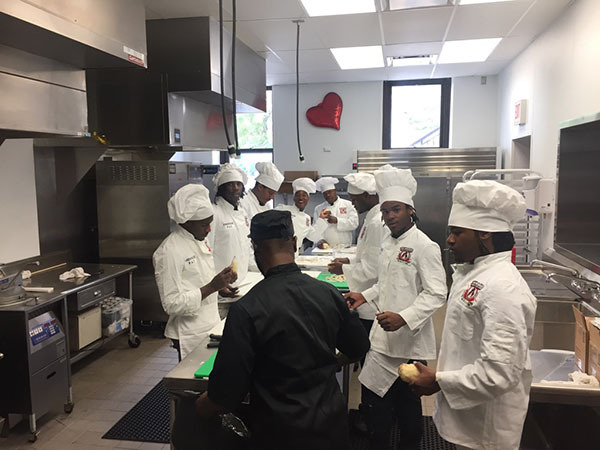 The culinary program began last week with two shifts of consisting of twelve students each. IBBQA would like to thank Equipment Dynamics Inc. for their leadership, guidance and countless hours their staff donated to the creation of a first-class culinary learning center. We thank Wood Food Systems and Southern Pride Barbecue Pits and Smokers, long time IBBQA supporters who supplied a broaster and commercial BBQ Smoker for the new kitchen. We thank FWE Food Warming Equipment Company for the donation of a premier hot holding cabinet to store the delicious ribs and chicken! While involved in the direct participation in supporting North Lawndale, we have witnessed great hope occur in a neighborhood that is filled with hopelessness and tragedy. To be able to help shine some light in the middle of all this is some kind of miracle, truly remarkable, very needed and helpful to the children and families in the North Lawndale community. On Friday, August 25th, the Mayor of Chicago, Rahm Emanuel and over forty Pastors, Priests, and Rabbi’s attended an open house to show support for the project and encourage a great school year for the children attending schools in Chicago. This milestone is by no means the end, but another step in Pastor Phil and the Firehouse Community Arts Center's 14-year journey to get where they are today, and still a long way to go to bring support, stability and safety to North Lawndale. We are changing lives, and the people connected with this project are changing ours. It is also true that the support and generosity of our membership will not be left unnoticed. Every positive action matters in areas like this and the big things display a beacon of hope for the people in the community. We just cannot thank all of you enough for supporting this type of work. Please do know the appreciation, respect and love that Pastor Phil, myself and the community has for your help and support.